The city of Rainier is located in eastern Thurston County. It has a population of 1,800 people and is in a fairly rural part of western Washington, between the small cities of Yelm and Tenino. The city is proud of its small town vibe and its convenience to the state capital of Olympia and the Pacific Northwest’s largest military base, Joint Base Lewis-McChord. 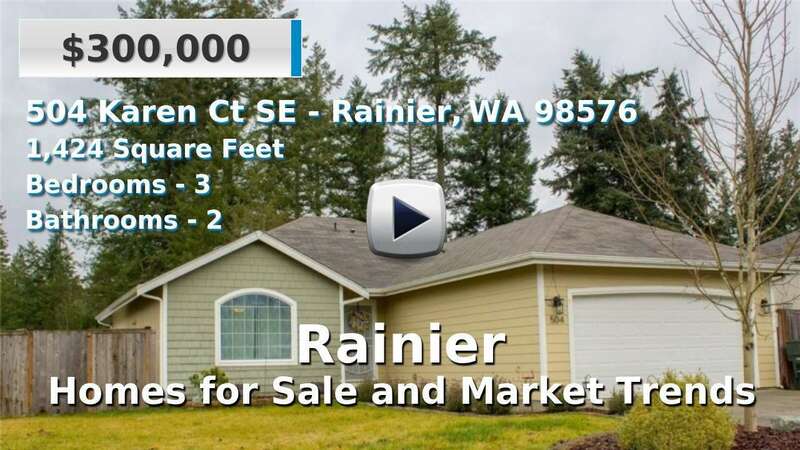 Homes for sale in Rainier are of average age and style for the state, though typically come with large lots or acreage. A typical commute is half an hour. 3 Beds | 2.5 Baths | 2269 sq. Ft.
3 Beds | 2.5 Baths | 3077 sq. Ft.
3 Beds | 2.5 Baths | 1902 sq. Ft.
3 Beds | 2 Baths | 1424 sq. Ft.
3 Beds | 1 Baths | 1304 sq. Ft.